On the auspicious occasion of International Women’s Day, we at Generations For Peace would like to highlight an important woman in our organisation – Ms. Judy Kent. Judy began her work with GFP in 2008 when she was asked to develop a curriculum for training peace builders, using sport as the vehicle for change. After developing the GFP curriculum – the curriculum that is the basis for Sochi Camp 2014 – Judy became Lead Facilitator. She has been heavily involved in all ten International GFP Camps and her contribution to their success cannot be understated. Her work outside of Generations For Peace includes running her own international consultancy which focuses on strategic planning and facilitation. Moreover she is a landscape painter, a photographer, a published author, an inspiring mentor and a cherished friend. As if these successes are not enough, Judy is also a legacy within the Commonwealth Games movement. She was the first woman to be named Chef de Mission as well as the first female President within the Commonwealth Games movement. 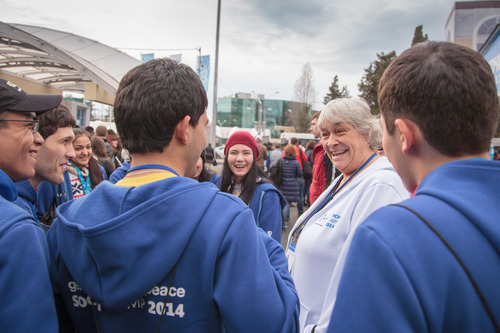 The Generations For Peace team would like to thank Judy for her passion, warmth, breadth of knowledge, and untiring dedication to Generations For peace. On International Women’s Day, a day to celebrate women who have played an extraordinary role in the history of their countries and communities, we salute Judy Kent!